Contractors specializing in Soprema Roofing, Waterproofing, Commercial Roof Repair, Commercial Roof Construction, and all other Soprema Commercial Roofing Services in CT. Call 1-888-766-3020 for a Free Quote. 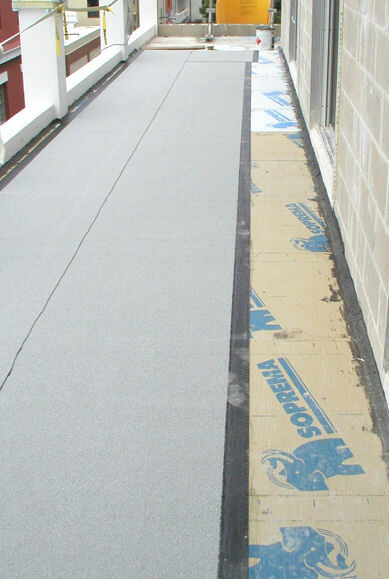 Soprema has been manufacturing roofing and waterproofing products for over 100 years and have created the world’s finest SBS Modified Bitumen roofing membranes. The 5 installation methods that Soprema offers for roofing membranes are Hot Asphalt, Heat Applied, Cold Applied, Self Adhered, and Mechanically Fastened. Soprema’s waterpoofing materials and SBS Modified Bitumen Membranes are used by New Roof Connecticut’s licensed and insured roof contractors throughout Hartford, Tolland, New Haven, Fairfield, Middlesex, New London, Windham and Litchfield County. We service all types of buildings and market segments including commercial offices, government buildings, medical offices, hospitals, schools, banks, industrial buildings, residential homes, commercial buildings, housing associations, and apartment buildings. Call New Roof Connecticut 1-888-766-3020 to learn about our Soprema roofing amd waterproofing solutions or request a Free Commercial Roofing Quote. Soprema also manufactures and supplies liquid systems for commercial structures with applications for roofing, waterproofing, balconies & terraces, parking decks and others. High performance liquid roofing and waterproofing products that Soprema manufactures are Alsan Urethane systems, Alsan RS PMMA systems used , and Alsan E-Kote systems used primarily in coating single-ply and metal roof buildings. When you're ready to waterproof your building project, Soprema offers rubberized asphalt, modified bitumen, self adhered and liquid applied application methods in a variety of different areas including plaza/parking deck, below grade foundation wall, insulated concrete form, garden roof and air/vapor barrier. Soprema offers a full line of superior waterproofing products designed specifically to keep moisture out. Soprema’s high performance line of self adhered roofing and waterproofing systems offer you a complete building envelop system with a one source warranty. Soprema is also committed to providing the industry with cutting edge, Eco-friendly Green Solutions for roofing and waterproofing. From Soprafix E roofing membrane to the innovative building integrated photovoltaic system, Soprasolar, Soprema will continue to create products for a "greener" tomorrow. Soprema has created a complete line of eco-friendly products for Roofing Membranes, Solar Energy, Reflectivity, Garden Roof, Bonding Agents, Primers, Insulation, Waterproofing, and Liquid Coatings. For more information about Soprema Roofing or Eco-Friendly Solutions then visit the Soprema Official Website or contact our Roofing Experts 1-888-766-3020 for more information. Please also feel free to request a Free Commercial Roof Quote.